A friend let me know that Father Michael Pfleger of St. Sabina was planning a Peace March on the Magnificent Mile this New Year’s Eve at 11am. Six buses of parishioners and volunteers had come from the South Side church. One volunteer named Greg Zanis created the nearly 800 crosses in honor of those killed in 2016 in Chicago due to gun-related violence. I put on my hat and gloves and headed down to Tribune Tower underneath the NYE “Chi-Town Rising” Star as the crosses were being unloaded from the trucks. They were numbered and grouped by the month of the person’s passing. First, family members were given the opportunity to find the cross of their loved one; one aunt told me she knew the exact number for her niece and was waiting for the May group. As the crowd waited, I turned to a woman next to me. 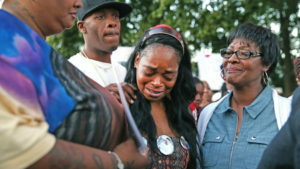 She clung to a poster of 27-year-old Erik and when I asked her about his story, she wept. I held her as she opened up about Erik’s sense of humor and travels to Minnesota. We sobbed together. I thanked her and moved through the volunteers. The mother of a young man named Isaiah killed an ingratiatingly short time ago told me she was wearing his pants. I offered to help her carry the weight of his cross plus his large framed portrait, but she said she would do this alone, as a mother’s duty. 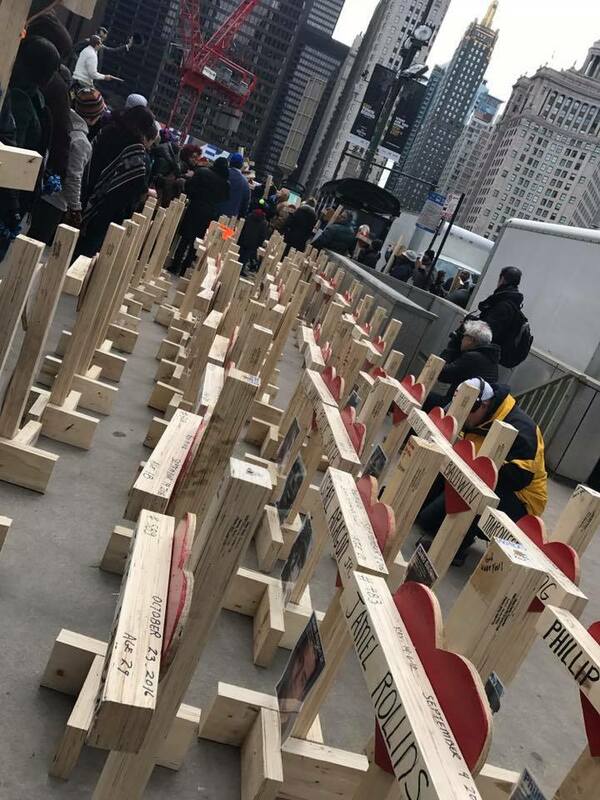 Once the majority of crosses were lifted and taken to the street in preparation for the march, it was announced that they needed volunteers for the remaining crosses. 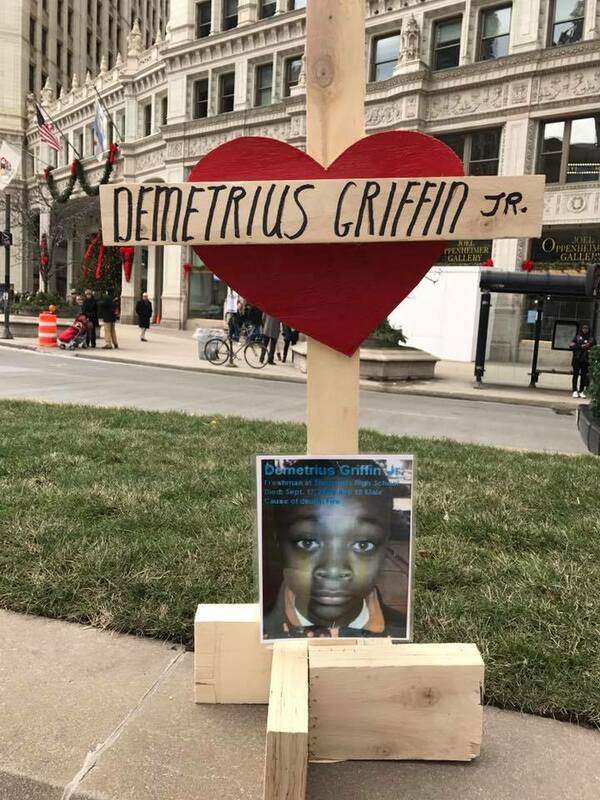 I looked down to see the cross of Demetrius Griffin Jr. No one had claimed it. His picture said he died at age 15. Cause of death: fire. This young man would enter my world. As we walked the cross became heavier and heavier, yet the honor I felt had more weight. Demetrius’ picture settled itself on my chest as I instinctually cradled him as his family once had in reality. Oh, the loss. I walked alongside a stranger carrying the cross of a young woman named Marilyn and we chatted about this loving, wounded city we share. Two Latina sisters with matching remembrance t-shirts shared the weight of a cross for a man named Luis. 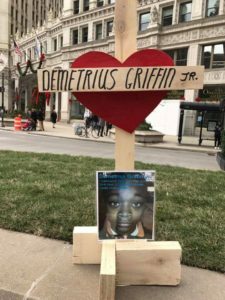 Tourists shopping on Michigan Avenue, CTA crew, police officers, and passersby all had tears in their eyes. It was quiet. An elderly woman with a walker was struggling with her smaller cross. As I stooped to assist her, Demetrius’ cross nearly fell. A stranger swooped in. She asked if she could take the cross the rest of the way. “Of course,” I responded. My pangs to hold onto Demetrius’ story longer were selfish but real. The woman explained that she is a Chicagoan here to shop but felt compelled to march with her city. I spent the last few blocks helping the elderly woman find a public restroom with proper access for people with disabilities; turns out that is much more difficult than it should be. Eventually, I helped the woman find her bus and said my goodbyes. I wondered how many of those we honored with crosses today were Christian and if that matters. I wondered how the city held or harmed them during their lifetimes. I wondered if one death was the cause of another death in a cycle of vengeance. I wondered how we as citizens can reconcile having so many guns and how need to stand together much more often. When I got home I straight away looked up Demetrius’ murder. As I had carried the weight of his cross and his story, I was humbled to have even a moment of connection with him. My gut flipped as I learned that he was burned alive in a garbage can just a few months ago. I can’t even. Would it be okay to reach out to his family or volunteer at his school? I could start with a blog post. These are not just statistics. These are human beings. Calling on all Chicagoans! Get personally involved! We cannot go into another year with blood on our hands, blood in the streets. Peace does not just happen. Peace is created.